We have been waiting for several years to start a computer lab in Barskoe, but there never seemed to be a competent teacher. When we asked if they had a teacher, yet, the director responded, “Yes, I am a computer teacher.” Woohoo! We had 3 super computers (not supercomputers) built with all the bells and whistles, and 3 great Acer monitors. Actually, I’ve never figured out the use of bells and whistles on a computer, but hey, I ain’t no rocket surgeon. Each child got a new Old Navy hoodie, fruit, Coke, and a great goodie bag with candy and cookies and a sled. If you want more than a dozen, or so, Cokes, you have to go to a couple of stores, maybe more. So, we went to the Coke distributor to buy several cases. When V told them the Cokes were for an orphan Christmas, they gave us 100 talking (push one paw to record, the other to play back), Coke Santa polar bears. Lagniappe (nah, didn’t even try to explain that one to them) for the kids. They loved them. We were given extra money to do something new and exciting for the kids, so, pizza and fireworks! A traditional Russian Christmas meal, don’tcha know? We photographed the kids and printed photos for them to remember the party. We ended the party with a “Happy Birthday, Jesus” cake. And, fireworks. Vitaly, the Russian Fireball, manned the firework show. He did not understand the concept of “bottle” rockets. I explained to him to put the stick deep enough into the snow to keep from falling over, but don’t push it into the dirt. Oh, by the way, these “bottle” rockets were four feet long. We watched from up on the hillside (I mean I am not as stupid as I look, really. ), as Vitaly lit the fuse and ran. Turns out, just like I warned, if you push the stick into the ground, its beautiful display of sound and color has a blast radius greater than a Russian can run in a timely fashion. See Vitaly Run. Run, Vitaly, run. See Vitaly glow. Glow, Vitaly, glow. It is amazing how fast you can watch fireworks, when the temperature is well below freezing, before considering the chill factor. 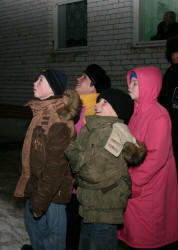 This was the first time for most of the kids to see fireworks. They said they never dreamed they were so loud. It was a great day for all, though Vitaly said the kids would probably remember these fireworks, so no need to repeat next year. Click here to view the slide show from our party.